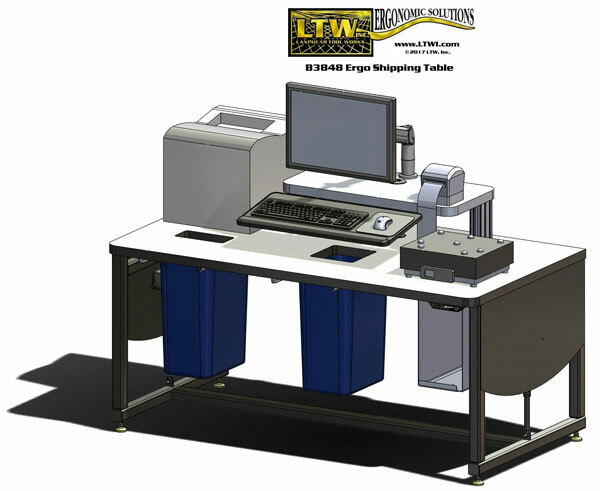 LTW’s E2 Shipping Table provides a home for every aspect of your shipping setup. Keep your shipping processes organized and under control with the E2 Shipping Table. Customize your table with options like a mounted monitor and trash/recycling chutes! Options not given on our website can be requested and we are happy to add them to your table. The foundation of the shipping table is LTW’s height adjustable patented E2 Base. 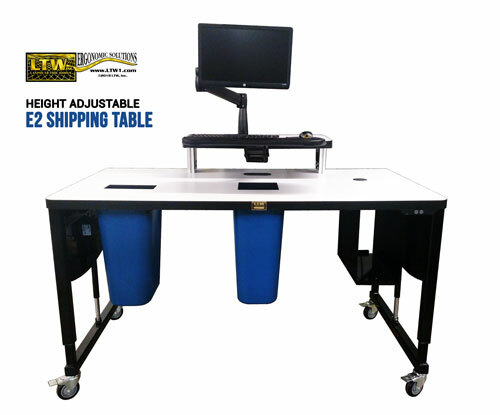 With the shipping table’s height adjustability, shippers of different heights can work at the same table ergonomically while reducing the risk of workplace MSDs and other problems that come with static tables. Note: Printers, Monitors, Keyboard, Mouse, and Scale not included, but can be added as additional options upon request.